Antoaneta Angelova-Krasteva joined DG EAC on 1 October 2016. She is currently Director for Innovation, International Cooperation and Sport. Her main responsibilities relate to bringing together higher education, business and research communities across Europe with a view to drive innovation in key areas and develop human capital. With her team, she also works on fostering cooperation in sports, promoting international cooperation in education and developing a mobile and highly innovative researcher base with the Marie Skłodowska-Curie actions. Antoaneta started her European Commission journey in 2008 in DG Justice, Liberty and Security where she was dealing with external relations and enlargement. She also worked at DG HOME on matters related to internal security and police cooperation. In the period 2011–2016 Antoaneta was Head of Unit in DG INFSO/CONNECT responsible respectively for cyber security, stakeholder relations and international affairs. Prior to joining the Commission, Antoaneta worked for her national administration in expert and managerial positions on matters related to Bulgaria’s accession to the EU in the field of justice and home affairs. She moved to Brussels in 2003 where she spent 5 years working at the Permanent Representation of Bulgaria to the EU. A graduate in political science of Sofia University, Antoaneta has also acquired training and qualifications in democracy and governance matters, and European studies in Germany (Wissenschaftszentrum Berlin für Sozialforschung) and the UK (Sussex University). She has also gained valuable professional experience from working for NGOs active on legal and political matters. Brando Benifei, European Federalist, is one of the youngest MEPs and is from La Spezia, Italy. His main fields of legislative work in the EP are Employment and social affairs and Foreign affairs. He is co-chair of the Youth Intergroup and vice-chair of the Disability Intergroup. Among his parliamentary activities in the Committee of Employment and Social Affairs, he is currently Rapporteur for the European Solidarity Corps and was responsible for key legislative and non-legislative reports on the social inclusion and integration of refugees into the EU labour market; youth employment policy such as the Youth Guarantee and the Youth Employment Initiative; digitalisation and rights of persons with disabilities. He was recently awarded the MEP Award 2018 for his commitment on employment issues, in particular youth unemployment. Bakhta has a degree as a socioprofessional integration counselor, and she started to work at Maks vzw in 2008 as an individual coach for low-skilled job seekers. Over the years, her activities have evolved from this individual support to group activities involving creativity, digital literacy and peer-to-peer learning. Currently she is working on an innovative project, in which participants use theatre techniques to practice their Dutch. In many of her projects, the use of Digital Storytelling has been an essential element. For example, she has worked with groups of women making digital stories on (partner) violence against women and with refugees on their life stories. At Maks vzw, Bakhta was the animator of the HURISTO project activities with adult learners. Sara graduated in Cultural Anthropology from La Sapienza University in Rome in 2009, then she completed her anthropological education at Università degli Studi di Genova. In the framework of her Master’s Degree in Anthropology and Ethnology in Genova, she conducted a two-year fieldwork both in Brazil and in Italy in the area of Religious Anthropology, Brazilian Ethnology and Inter-religious Dialogue. In Brazil she carried out a long field research and attended several courses at Universidade de São Paulo (USP). In addition, Sara obtained a second Master’s Degree at the School of Oriental and African Studies (SOAS) in London in Development Studies, specializing in the field of International Development, Forced Migrations and Natural Resources Management. She completed several courses in Project Management and Evaluation and worked in numerous projects during her internship at Cies Onlus focused on intercultural and inter-religious communication, sustainability, Global and European Citizenship. At Università degli Studi Guglielmo Marconi she currently plans project proposals and manages national and international funded educational projects. She is a project assistant for the BRIGHTS (“Boosting Global Citizenship Education using digital storytelling”) project. Paolo Celot is an economist from Pisa University and a European affairs advisor specialised in the media sector. Founding member and Secretary General of EAVI – the European Association for Viewers Interests, a not-for-profit organization active in the fields of media literacy, disinformation and citizenship. Before moving to Brussels, he worked extensively in the private and public broadcasting sector both in London and Milan, working with the BBC, RAI and with private channels as well as with television advertising agencies and various public institutions. Paolo has written books and articles, produced audiovisuals and authored four Europe-wide studies in 28 EU countries on behalf of the European Commission. Greatly interested by the numerous challenges posed by emerging media forms, he delivers presentations on media literacy and citizens-related issues across Europe. Isabel is the Business Development Coordinator in Education at Europeana Foundation. She develops partnerships with relevant players on the educational market, including ministries of education, industry (digital publishers and app developers) and non-profit (networks and associations) educational organizations. She possesses a Bachelor’s Degree in Political Sciences, a Master of Arts in Cultural Management and a Master of Science in Corporate Communications. She has also received professional training in Arts Management by the NYU. She’s been working as a consultant for public organizations, as well as a fundraiser and acquisition manager for the Museum of Contemporary Art in Barcelona, where she was involved in several educational projects. Veronique is the founder and director of Maks vzw (Belgium). Maks vzw, established in 1999, has 2 telecentres and runs all kind of activities in the field of digital inclusion with disadvantaged persons of all ages, using the peer to peer learning and learning by doing methodology. Maks vzw has participated in different European projects as a partner of ALL DIGITAL. Before working for Maks, Veronique was a director of a VET school for youngsters between 15 and 20 years old (alternate working-studying). From 1982 till 1987, she was a teacher in the same school, teaching Dutch, French, and computer technology. Veronique is also a certified coach. In 2015-2016, she helped the Board of ALL DIGITAL (then Telecentre-Europe) as a financial controller and supported the staff of ALL DIGITAL in some practical aspects. Jan has a Bachelor’s Degree in French and Spanish literature and linguistics and a Master’s in Cultural Studies. He started his career as a language trainer. During this time he specialised in non-formal teaching methods and particularly Content Language Integrated Learning. He worked as an e-facilitator and digital literacy project manager in the public library of Forest in Brussels. He went on to become manager of the digital inclusion department of MAKS vzw, running a diversity of projects and training focused on empowerment of diverse vulnerable urban groups through digital media. He contributed to the development of digital storytelling methodologies as a digital inclusion strategy. Jan currently lives in Newcastle upon Tyne, working as a freelance trainer, project manager and fundraiser for Digital Voice for Communities. He is currently working for Digital Voice on the delivery of media literacy courses for refugees and digital reminiscence projects for dementia patients in the Northeast of England. Jan occasionally works with ALL DIGITAL and MAKS vzw as a bid writer and was involved in the delivery of the MOOC in the BRIGHTS project. He currently works as a Quality Assurance Expert for the WELCOME project, which he helped develop. Marc Durando, Executive Director of the European Schoolnet (EUN), has over 35 years’ experience in the field of education and training, both at European and national level. He has worked in the education and training area since 1983, where, after five years in the field of continuing education for enterprises, he developed specific expertise on European cooperation in the field of education and training. In September 2006, Marc Durando joined the European Schoolnet network as Executive Director of EUN. As a network of 34 MoE, European Schoolnet’s mission is to support ministries of education, schools, teachers and relevant education stakeholders in Europe in the transformation of education processes for 21st century digitalized societies. – support mainstreaming teaching and learning practices aligned with 21st century standards and expectations for the education of all students. 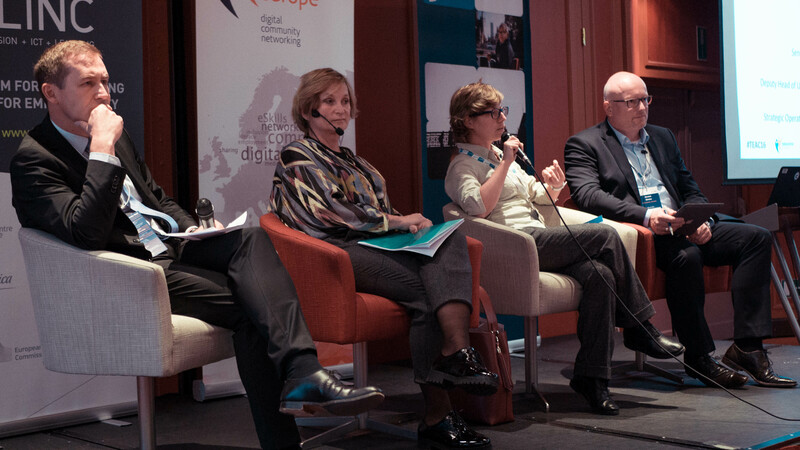 ICT and digitization are a particular focus of European Schoolnet’s work, because of the critical role they play in terms of designing and implementing future classroom scenarios and supporting new forms of learning both in and out of school. Since 1 December 2015, Paolo Fontani is the Director of the UNESCO Liaison Office in Brussels and the UNESCO Representative to the European Institutions. Before arriving to Brussels, Mr Fontani was the Director of the UNESCO Office in Kabul. He joined UNESCO in 1996 and worked in Bosnia, Kosovo, Afghanistan, the Caribbean, and Brazil. Mr Fontani holds a Master of Laws degree with a specialisation in international law and human rights from the University of Pisa (Italy) and an MA in Education and International Development from the Institute of Education, University College London (UK). Hana Galogaža Lanča is a youth worker, trainer, PR and project manager in one. For the last five years she has worked in Centre of Technical Culture Rijeka (Croatia) creating, researching, implementing, promoting and enjoying digital inclusion programmes in her community. Since she likes to travel, you can find her all around Europe working on international projects. She has created educational curricula for non-formal education and an online educational platforms, worked as a radio host, organised festivals and all kinds of events. Her main interests are multimedia, content creation, and social inclusion, and she combines them successfully. Hana is finishing the lifelong learning programme “Youth in Contemporary Society” of the University in Rijeka and is one of the six youth workers in a national expert group in the biggest Erasmus+ project ever ‘Europe Goes Local – Supporting Youth Work at the Municipal Level’. Also, she is a national tutor for the Brights project where she cooperated with more than 100 formal and non-formal educators in developing digital stories with youngsters. She has a master’s degree in cultural studies. Eric is a media coach and animator from Brussels, Belgium. He was the facilitator of the HURISTO ‘Train the Trainer’ workshop in Turin in February 2018. He has been working on media literacy projects since 2000, mainly at Maks vzw in Brussels, but also on projects in Brasil and Nicaragua. The aim is always to empower (disadvantaged) people to express themselves and create and share their own stories. At the same time they acquire 21st century skills and develop their media literacy. Besides coding projects with children and youngsters, ‘Digital Storytelling’ is one of Eric’s preferred methodologies. He is a filmmaker by trade and also obtained his teacher’s training degree. In 2016, Eric was a finalist for Telecentre-Europe Awards (now ALL DIGITAL Awards) in the category ‘Best e-facilitator‘. Pip Hardy and Tony Sumner founded the Patient Voices Programme (UK) in 2003. Their intention was to gather and share important digital stories of healthcare (and sometimes the lack of it) to augment, enhance and provide a balance for, the quantitative data that informs most decisions about how healthcare is designed and delivered, educated and evaluated. Pip’s first degree is in English literature, which she put to good use teaching in non-traditional contexts, with homeless and unemployed people, prisoners, women returning to work, people housebound by illness or caring responsibilities and others unable to access conventional education. In the mid-80s, she moved behind the computer to specialise in designing, writing, editing and managing the development of large open and distance learning programmes across a range of subjects. Soon after setting up Pilgrim Projects with Tony Sumner in 2000, they were commissioned to undertake extensive work in the field of healthcare quality improvement. It soon became obvious that stories were key to the development of reflective practitioners and, in turn, to the transformation of healthcare, and the Patient Voices Programme was born. Since then Pip has obtained an MSc in lifelong learning and a PhD investigating the potential of digital storytelling to transform healthcare. Achilles Kameas is Associate Professor with the Hellenic Open University, where he teaches Pervasive Systems and Software Design. He is the Director of the Postgraduate Study Programme on “Engineering of Pervasive Computing Systems”, the Head of DAISSy (Dynamic Ambient Intelligent Social Systems) Research Group, and Vice-chair of the Board of ALL DIGITAL European network. Achilles pioneered the realization of the Ambient Intelligence vision; nowadays he contributes to creating an equal and inclusive society via the development of the digital skills and scientific knowledge of ALL citizens. He has participated in more than 30 EU and national projects (coordinated more than 10 of them), has published over 150 journal articles, conference papers and book chapters, and authored / co-edited more than ten books. He has contributed to the standardization of European e-competences framework, the application of DigComp framework and the development of ESCO. His current interests include learning platforms and MOOCs, education for inclusive society, flexible learning pathways, STEM education, digital and ICT competence frameworks, and of course, Internet of Things and mobile computing systems. Born and raised in Texas, Joe has been active in the Bay Area arts community for the last 25 years as an arts activist, producer, administrator, teacher, writer, and director. Joe Lambert founded the Center for Digital Storytelling (now StoryCenter) in 1994. He and his colleagues developed a computer training and arts program known as The Digital Storytelling Workshop. Joe’s and his staff have traveled the world to spread the practice of digital storytelling, to all 50 US States and some 48 countries. Lambert is author of Digital Storytelling: Capturing Lives, Creating Community (5th Edition, Routledge) and his more recent Seven Stages: Story and the Human Experience(Digital Diner Press). In 2018, Lambert celebrates his 35th year as an Executive Director, having evolved his work in the 1980s in the performing arts to work in digital storytelling and media education in the 1990s. Joe has produced over 500 shows, ranging from theatrical runs and single performances, to citywide festivals and digital story screenings. Prior to his career in the arts, he was trained as a community organizer and assisted in numerous local, statewide, and national public policy campaigns on issues of social justice and economic equity. BA, Theater and Political Science, University of California at Berkeley. Theodor Panagiotakopoulos received his Diploma and PhD from the Department of Electrical and Computer Engineering, University of Patras, Greece in 2006 and 2011 respectively. His research interests include, among others, pervasive computing, internet of things, ambient intelligence, context awareness, biomedical engineering, mobile health and ambient assisted living systems, telemedicine and biomedical applications. He has published over 20 articles in international conferences and journals, as well as in international book chapters and has participated in six National and European R&D projects holding key positions at research, technical and managerial level. He is currently working at the Hellenic Open University as a senior researcher in the mobile and pervasive computing, quality and ambient intelligence lab. Since 2016, he has been an adjunct assistant Professor at the Department of Electrical and Computer Engineering of University of Patras, and since 2015 he has been an invited lecturer at the postgraduate courses of the School of Medicine of University of Patras. Emilian Pavel is a Member of the European Parliament since 2014, working in the Committee of Employment and Social Affairs, and the Committee of Civil Liberties, Justice and Home Affairs. He is also a member of the Delegation for relations with Israel, Delegation to the EU-Serbia Stabilisation and Association Parliamentary Committee, Delegation to the Parliamentary Assembly of the Union for the Mediterranean. His priorities in the European Parliament include Digital Agenda, youth entrepreneurship and employability, lifelong learning and education. In the beginning of 2017, he was chosen as MEP of the year for Employment and Social Affairs. He is the president of the Friends of Serbia informal group and an ambassador for the European Entrepreneurship Education Network. He holds a Bachelor’s Degree in computer engineering and a Master’s Degree in environmental protection. He has been involved in politics for over 15 years and he is one of the Vice Presidents of the Young Romanian Social Democrats organisation. He has held various positions within the Social Democratic party at regional and national level, and has acted as Director in the Romanian Ministry for Youth and Sport. – Coaching people without a degree and second chancers find a job in the world of multimedia and ICT. Jasper is educated in Coaching, Film, and Social Youth Work. He is a strong community and social services professional with a Master’s focused in Multidisciplinary design from Ghent University – School of Arts Gent. Ilias Rafail is the Training Manager at IASIS NGO (Greece), psychologist, and Adult Trainer (MA in Adult Learning) with many hours of training in various fields. In his 22 year career time he has been involved in a) the provision of counselling services; b) the participation and coordination of a significant number of national and transnational projects as project manager; c) the development of Vocational Guidance tools as well as of educational and support material; d) elaboration of several studies and researches on VG and other related issues, coordination of training programs (communication with trainees, trainers, associates and enterprises where the trainees practicum is implemented). Ilias Rafail has accreditation as Expert/ Inspector from TUV Austria Quality Standards, with many hours of inspections in Health Units (Hospitals, Clinics according to ISO Quality Systems) and he is a SALTO Youth Trainer accepted also by several NAs. Tony Sumner and Pip Hardy founded the Patient Voices Programme (UK) in 2003. Their intention was to gather and share important digital stories of healthcare (and sometimes the lack of it) to augment, enhance and provide a balance for, the quantitative data that informs most decisions about how healthcare is designed and delivered, educated and evaluated. Tony has a BSc in physics and a post-graduate diploma in astronomy and astrophysics. He spent the first 20 years of his professional life in the software industry, initially designing guided missiles before withdrawing to the safer territory of researching the human computer interface and engaging in software quality assurance before joining Pip Hardy to establish Pilgrim Projects as an educational consultancy. Soon after setting up Pilgrim Projects with Pip Hardy in 2000, they were commissioned to undertake extensive work in the field of healthcare quality improvement. It soon became obvious that stories were key to the development of reflective practitioners and, in turn, to the transformation of healthcare, and the Patient Voices Programme was born. Despite his scientific background, Tony has an ear for a good story and he ensures that the technology necessary for successful digital storytelling is always working smoothly. Fernando Trujillo Sáez holds a PhD in English Philology and is an Associate Professor of the Department of Didactics of Language and Literature at the University of Granada. Fernando is a member of the Advisory Board of Language Politics of the Government of the Autonomous Community of Andalusia. He was also a member of the Council for the Elaboration of School Language Project of the Council of Education of the Autonomous Community of Andalusia. He designed the School Language Project for the Autonomous Organism for the European Educational Programs during 2011/12. Additionally, he coordinated the School Language Project of the Council of Education, Culture, and Sports for the Government of the Autonomous Community of Andalusia during 2013/14 and 2014/15. Among others, he has led several courses for the Ministry of Education of Spain, of the Council of Education of the Autonomous Community of Andalusia or of Cervantes Institute. He has been a lecturer in different national and international universities and teacher training centres throughout all Spain. In 2017 he received the 1st Award of the University of Granada and Rural Savings Bank of Granada for the Communication and Innovation in Digital Media (2016). He is a founder and a member of the Advisory Scientific Committee of Conecta13, spin-off of the University of Granada dedicated to consulting about education, personal development, and ICT. He coordinates the research group “Open Knowledge for Social Action”. Graziano is the programme officer of the Youth Cooperation programme of the North-South Centre of the Council of Europe: intergovernmental organization based in Lisbon that foster democratic participation and awareness about global interdependence through intercultural dialogue and global citizenship education. The Youth Cooperation Programme promotes capacity building and networking initiatives aimed at facilitating young people and youth organizations’ involvement in decision and policy making processes at all levels of governance. Within the Youth Cooperation programme, Graziano Tullio coordinates a task force that was established in the framework of the ILegend project with the aim to advocate, raise awareness and build capacities (also by producing a tool-kit for educators) on the media literacy dimension of Global Education. Graziano holds a master’s degree in Communication for international institutions, he has more than 15 years’ experience in the public and NGOs sectors in the field of peace and human rights and has extensively worked as trainer in Europe, Asia and Middle East covering topics related to inclusion, intercultural dialogue and democratic participation. Altheo Valentini is a project manager at Centro Studi Foligno and general manager of European Grants International Academy (EGInA) (Italy). He has worked for more than 10 years as a consultant in European projects and has a solid expertise in the preparation, implementation, and coordination of educational projects in the framework of different financing instruments of the European Commission, with a particular focus on social and digital innovation. He is an expert in the exploitation of the ECVET tools and strategies, with a specific focus on the digital empowerment of VET students and teachers. Altheo Valentini is also involved in the implementation of the Youth Guarantee programme in the Umbria Region, being responsible for the strategic planning of training interventions aimed at enhancing the employability of youth and young adults. He is a member of the coordinating committee of the national association “Stati Generali dell’innovazione” with responsibility for School and Culture and the Board member of ALL DIGITAL. He has M.A. in “Publishing, media and journalism”, thesis on “The dissemination plan of European projects”, University of Urbino Carlo Bo. Catherine Williams is Communications and Public Affairs Manager at Google in Brussels. During a three-month secondment to Washington DC in 2017, she managed the Google Online Safety Roadshow teaching children the tips and tricks of how to stay safe online. This fuelled a new passion for digital citizenship and youth empowerment online. Her interests lie in the intersection of technology and real life: How can we raise young people to be good citizens online as well as offline? How can we make sure that technology is accessible and fair for everyone regardless of ability, gender, race or background? Catherine holds a First Class BA Hons in French and German from the University of Leeds, UK and an MA in Conference Interpreting and Translation studies also from the University of Leeds. She has recently been awarded a scholarship from the Financial Times for an Executive MBA at Henley Business School in the UK. You can also see the speakers from ALL DIGITAL Summit 2017 and Telecentre-Europe Annual Conference 2016.